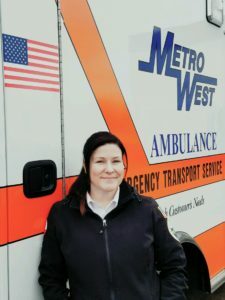 Jennel began her career in EMS as a volunteer firefighter and EMT at Lane Co. Fire District (now Lane Fire Authority), in 2008, and is now a Paramedic with Metro West Ambulance. Jennel truly values the training, experience, and support she received during her five years as a volunteer. Throughout her time as a volunteer, Jennel was awarded the EMT of the Year in 2010 and Public Educator of the Year in 2011. Jennel became a Paramedic in 2013 and was hired by Metro West Ambulance in January of 2015. She was chosen as this year’s Star of Life recipient for Metro West Ambulance Eugene-Springfield because of her commitment, dedication, and passion for growth. Jennel is not afraid to step up to the plate and accept extra duties. On top of her ambulance and FTO duties, Jennel also helps with interviewing, hiring, and training new employees. She became an ACLS instructor late last year, with plans of obtaining additional instructor training in the near future. Jennel hopes that people can look up to her as a role model, and she enjoys helping those around her succeed. Jennel believes her own personal success is in part due to those around her. Her superiors at work, her parents and siblings, and her husband and kids, all help make her into the outstanding Paramedic she is today. Jennel’s husband is also a Paramedic, and having that support is invaluable to her.